Another one bites the dust on AMC’s The Walking Dead. Sunday night, the last few minutes of the episode titled “Judge, Jury, Executioner” were dedicated to one character’s untimely demise. If you haven’t watched last night’s The Walking Dead, please divert your eyes. It’s about to get spoiler-y. This week, the survivors were stuck in a real 12 Angry Men situation. They had to decide if they should keep or kill Randall, their unlucky captive. Most of the group felt he was a danger and needed to be taken out — permanently. The only voice of reason was good ol’ Dale (Jeffrey DeMunn). He thought that killing an innocent man would take them down a dark path. We watched as Dale preached and fought for Randall’s life before having the rug pulled out from under us. At the end of the episode, Dale marched into a field and was taken down by a walker. The zombie threw him to the ground and ripped open his stomach, leaving nothing to the imagination. Daryl (Norman Reedus) quickly rushed to his aid, but was too late. The damage had been done. Dale was in pain and had to be put out of his misery. Rick (Andrew Lincoln) held a gun to his head but was unable to pull the trigger. So Daryl stepped in and finished the job. He kneeled, pointed and said, “Sorry, brother.” Cut to black. Why? Why would they kill off Dale? 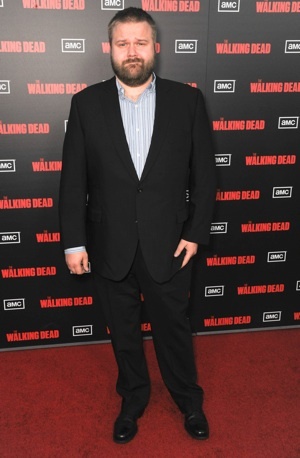 Walking Dead creator and executive producer Robert Kirkman says there’s a method to the madness. The Walking Dead airs Sundays at 9 p.m. ET/PT on AMC.